This entry is part 4 of 6 in the series Up on the Mountain. Over the past few Mondays, I’ve been talking about spiritual mountaintops, how it’s so easy to get caught up in our emotions that we become convinced that we’re as close to God as we’ve ever been. But then we tumble back down the other side and crash. Moses had just such an experience when he received the Ten Commandments. But he’s not the only one. The prophet Elijah also had an experience that followed the same general pattern as Moses’s: two mountains with a valley in-between. It’s one of my favorite stories in the Old Testament. God had basically declared a spitting match against the false god, Baal. Baal was supposedly the one who caused it to rain. God claimed that He did that. So the contest was simple: God said it wouldn’t rain. If it did rain, then Baal had somehow overpowered God and he was clearly the superior deity. According to the Bible, it didn’t rain. For three years. But God wasn’t done yet. 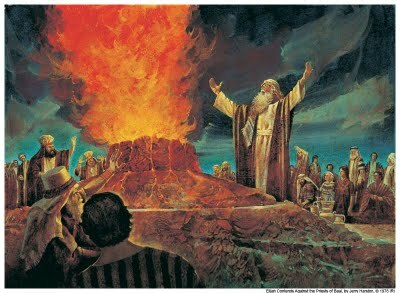 He sent Elijah to confront Ahab, the King of Israel who was largely responsible for bringing Baal worship to God’s people. Well, it wasn’t exactly him, but I’m getting ahead of myself. Elijah did as he was told. He challenged the priests of Baal to a Biblical smackdown. They would meet on Mt. Carmel and see whose god had the power, either the Lord or Baal. They would set up two altars, one for God, one for Baal. They would set out sacrifices for both deities. Whoever sent fire from heaven to consume the sacrifice first would win. The priests of Baal went first. Things did not go so well with them. Even though there was five hundred of them, they couldn’t seem to get Baal to act. They even went so far as to cut themselves open, thinking that maybe the blood would get their god’s attention. No such luck. Elijah behaved with dignity and aplomb. By which I mean that he trash talked them, wondering aloud where their god was. He even implied at one point that Baal might be in the bathroom. God showed ’em. Fire fell from heaven and consumed, not only the sacrifice, but the altar and the water as well. The people of Israel were convinced. They took the priests of Baal, all five hundred of them, and slaughtered them. Rain started falling. And Elijah, filled with the Spirit of the Lord, outran King Ahab’s chariot. Talk about a mountaintop experience! Elijah had definitively shown the Israelites that they had been wasting their time with Baal. Ahab and his cronies had been put in their place. And things should be great, right? Waiting in the valley was Jezebel, Ahab’s wife. She was the one largely responsible for bringing Baal worship to Israel. Those were her people that the Israelites killed after the showdown on Mt. Carmel. And she was furious at how things turned out. She sent word to Elijah that she was going to kill him over what happened. Elijah took the threat seriously, so much so that he fled Israel. Once he was safely over the border and in Judah, he lay down and basically said that he was done. He was ready to die. Sounds to me like Elijah was battling depression at that point. It sounds to me like he had come down off the mountain. That’s another reaction we can have when we come down off a spiritual mountain. We can become depressed. The euphoric feeling didn’t last. Things went back the way they were. We may even meet as much hostility as Elijah did. And it can be too much. We can feel just as hopeless and helpless as Elijah did as he lay under the broom tree in Beersheba. But God wasn’t done with Elijah yet. I have been very zealous for the Lord God Almighty. The Israelites have rejected your covenant, torn down your altars, and put your prophets to death with the sword. I am the only one left, and now they are trying to kill me too. So God tells him to go out onto the side of the mountain, for He’s about to pass by. Elijah goes out and he witnesses a great wind shattering the rocks before him. That’s followed by an earthquake, and then a fire. But each time, we’re told, God wasn’t in any of those things. Then Elijah hears a still, small voice. A whisper, as it were. The minute he hears it, Elijah hides his face and goes back into the cave. Why? Because he realized that God was in that whisper. Once again, God asks Elijah what he’s doing there. And Elijah responds the same way that he did before. So God gives him his marching orders: anoint Hazael as the new king of Aram. Anoint Jehu the new king of Israel. And appoint Elisha as your successor. So what was the point with the whisper? Well, before this point, God was all about the wind, the earthquake, and the fire. He operated in big, flashy ways. Think the flood, the parting of the sea, even fire falling out of heaven. But now, He’s going to be more subtle. His presence will be a whisper, working through the threads of history, through people like Jehu and Hazael. Elijah went back up the mountain and, in so doing, learned how God was going to deal with human beings from then on. Moses reacted with anger. Elijah reacted with despair. But there’s one more story to consider, and one more reaction that may seem all too familiar. Tune in next week to learn more.